The October General Membership Luncheon meeting will be held on Tuesday, October 18, 2016 at the Portsmouth Renaissance Hotel. 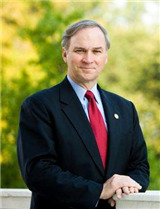 The Guest Speaker will be Congressman J. Randy Forbes, Representative of Virginia's 4th Congressional District in the United States House of Representatives. Congressman J. Randy Forbes has served on the House Armed Services Committee for the past 14 years and is currently Chairman of the Seapower and Projection Forces Subcommittee. As Chairman, he is responsible for the research, development, acquisition, and sustainment of Navy and Marine Corps programs, as well as the Air Force's bomber and tanker fleets. Prior to the 113th Congress, he served as Chairman and Ranking Member of the Readiness Subcommittee from 2009-2012. Hailing from Chesapeake, Virginia, Chairman Forbes is one our nation's most forceful advocates for a strong national defense. Chairman Forbes has been a key voice in Congress calling for a stop to the transformational defense "sequestration" cuts threatening our women and men in uniform and the future security of our nation. He is one of our Nation’s strongest champions for a larger, more robust Navy fleet, consistent with the needs of our Combatant Commanders. Chairman Forbes has advocated maintaining a robust defense industrial base with an emphasis on new, game-changing technologies. He is also a nationally-recognized champion for our warfighters and veterans. He is one of the few individuals to have received the highest civilian honors from both the US Army and the US Navy. Chairman Forbes has called for accountability and transparency at the Pentagon, including a full audit of our national defense spending, in order to reduce waste and adequately quantify the needs of our warfighters. As a conservative Member of Congress, Chairman Forbes has called for a Balanced Budget Amendment and was 1 of only 17 Members of Congress to vote against every bailout and stimulus package under the Bush and Obama Administrations. Chairman Forbes has also been a leading voice in calling attention to the complex challenges associated with the rise of the People's Republic of China. In 2005, Chairman Forbes founded the Congressional China Caucus to help educate Members and staff about the military and economic elements of the US-China relationship. He is a frequent commentator on Asia-Pacific security issues and the author of numerous OpEds. He has spoken at venues including Harvard University, the American Enterprise Institute, the Brookings Institution and the Council on Foreign Relations. Chairman Forbes has introduced legislation calling for a comprehensive strategic framework to protect American interests in light of Chinese military modernization and more aggressive foreign policy.